Watch someone floating almost blissfully on their back and you wonder why it doesn’t come naturally to everyone. It’s a wonderful skill to develop even when you already know how to swim. Density, Buoyancy, Gravity – Floating or Sinking … Physics! Want to Test Your Buoyancy? Anyone can learn to float at least to some degree, adults and kids alike. Some people can truly lie in the water, be completely still, not move at all and just breathe. Others might be just as relaxed but need to keep moving their limbs a little to prevent sinking. Why? If reading this reminds you too much of school, and not in a good way, just take a deep breath and you’ll find you know all this through experience. It floats or it sinks. Why? When placing things in the water there are always two forces working in opposite directions. Gravity pulls everything down, just like on land and water upthrust pushes everything up. Objects like inflatables float because they are light for their size. Their buoyancy is high and the water has a huge area to push and support to keep it afloat. Little buoyancy, however, means sinking like a stone. This buoyancy, i.e. 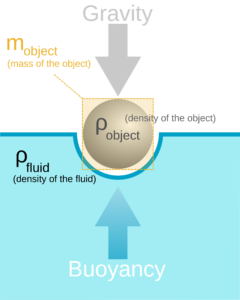 whether an object or body floats or sinks depends on the difference of its density compared to the density of water. Anything more dense than water will sink. Are you more or less dense than water? Density is measured in weight per volume. Pure water is a handy 1g/ cm33 (gram per cubic centimetre). Any mineral or rock has at least double or even several times the density of water which is why pebbles accumulate at the bottom of the pool. Yep, also true for your iPhone. Wikipedia assumes a density of 1.01 cm3 for the “average” human body. So, just a little denser than water. This means that this average body, without air in the lungs, would sink in pure water. Did you just imagine all those people floating in the swimming pool? Of course not. Note that the density values above are for pure water and an “average” body. As mentioned before, relative density is key to floating. Let’s imagine two people in the pool: A skinny teenager and a stouter middle-aged man. Chances are, the man floats easily whereas the skinny teenager has to keep kicking and moving to prevent sinking. In other words, the density of people varies quite considerably: enough to make a difference in how well a person can float. Muscle and fat make the biggest difference: the more fat a person has the easier it will be for them to float. Skinny or athletic people tend to struggle with floating but put them in a fake-fat wetsuit (neoprene) and they’ll float too. Most people can float as there is enough fat to keep them afloat. Only a very few can’t – they have “negative buoyancy”. Ocean water has a higher density of 1.020 to 1.070 g/cm3 which explains why practically everybody can float there. 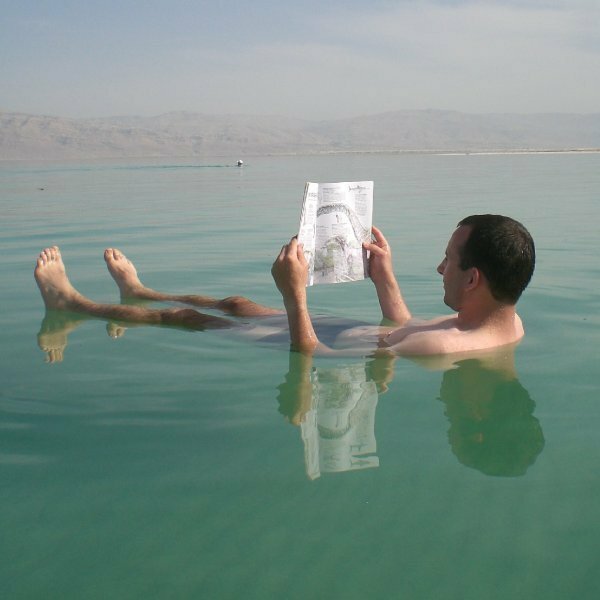 It’s not surprising then how people who struggle to float normally find it incredibly relaxing when they put on a wetsuit and swim in salt water, float in a brine spa or swim in the Red Sea. Here is one way to find out – in a safe way, in the shallow end of a pool – provided you are comfortable to put your face under water. How to test your own buoyancy with the “hedgehog float” – click here. Knowing how to float is incredibly useful when learning to swim. As you will see below you don’t even have to go into the deep end but can start where you can still stand comfortably. Learning to float on your back is the easiest way to pick up because it allows you to keep breathing safely while getting used to being in water. You will build up your confidence in floating and the more trust you have the easier it is to feel relaxed and light. You will need the water to be calm. Ocean waves would make it very difficult to lie back without getting waves splashing over your face. A quiet pool is usually the most convenient and safest option. Watch the following video how to float on your back. Then read on for further instructions. The first goal is to lie back, keep breathing gently and doing just enough with your legs and arms to keep your balance. Safety first: start at the shallow end of the pool. You need to be deep enough to have enough room for floating but shallow enough to feel safe and be able to stand up if you want to. 1. Hold on to the side of the pool. 2. Slowly lean back and lie on your back. 3. Make a starfish. Spread your arms and legs wide to distribute the weight over a wider area, making it easier to float and keep your balance. 4. Tilt your head back. (Moving your head forward will make your hips sink lower). Relax, Tensing up muscles makes you go “heavy” and sink, relaxing means feeling lighter. Optional: gently move and kick your legs to keep them high in the water if needed. Gently move your arms to keep yourself in balance. Variation 1: Play with tensing your muscles on purpose and notice how your body sinks deeper. Relax and notice your body floating up. You could also imagine being light as a feather or something similar. Variation 2: Move your head forward and notice how your torso and legs move downward. Variation 3: Take a very deep breath to “inflate your belly” and notice how your body floats further up. Breathe out completely and notice your torso sinking lower. Instead of holding onto the side of the pool for safety, in method 2 you will use another person to help you get into the right floating position. As you lean back the spotter places her hand under your upper back. Position of your head: Waterline is at about mid cheek level. Chin up, but not too much, just enough so it’s level with your nose. Ears are in the water. If you worry about ear infection make especially sure to dry them thoroughly after swimming. Lift your chest and hips. Let the legs float. Depending how muscular your legs are they may sink or float on the surface easily – either is fine and normal. Stretch your arms out as when you want to make yourself big. Make sure palms facing up to the sky or ceiling. Troubleshooting: when outstretched arms don’t work for you and you don’t seem to get your chest to float enough: Place your hands under your head and press your elbows down, towards the bottom of the pool. This will lift your chest and the hips and legs will follow, too. The safest and most gentle method. This video demonstrates how calm and relaxed people can learn to float. 1. Go to the side of the pool where the water is about belly deep. 2. Hold onto the pool side with both hands. 3. Lower your body into the water. 4. While still holding on to the side of the pool, gently lean back. Let your head be carried by the water as if it was a pillow. Relax even more into the water. If you have a spotter she could gently place her hand under your upper back for support. 5. When you are ready your hands can let go of the pool side, your body drifting ever so slowly on the surface of the water. Notice how the water is carrying your head, torso and arms. Your feet may still touch the bottom of the floor – that’s fine. This is actually easier to learn than floating on your back. Provided you are comfortable holding your breath while having your face under water. Move to the same pool depth as for floating on your back, so the waterline is somewhere between your belly and chest. Take a deep breath and slowly lie on your front. Spread out arms and legs into a starfish pose. When you need to come up to catch your breath, stand up, relax and breathe calmly. Ever tried to float vertically? Click here to find out how.